When you are a wheelchair-user, you really notice when a bathroom is designed properly and meets your every need. Too often we are confronted with public restrooms, as well as hotel bathrooms, with designs that inhibit our independence and make life more difficult. When given the chance to remodel our existing bathrooms or build a new house with custom bathrooms, we need to pay attention to all the details. Size does matter. An improperly sized bathroom can force us into a world of frustration and a lack of privacy. I know from experience. It has been eight years since my spinal cord injury. In my current home, the door from my master bathroom had to be removed in order for my wheelchair to fit through the opening. My powder room is so small that when I use it, my wheelchair extends into the hallway, preventing me from closing the door. That’s all about to change! My husband and I are building a new national model universal design home in metropolitan Columbus, Ohio. 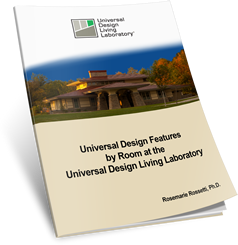 The Universal Design Living Laboratory (www.UDLL.com) will have 3½ baths. As a part of my research to design these bathrooms properly, I went to the new home of injured Iraq war veteran Mark Mix and his wife Jasue. Mark and Jasue each have their own bathroom. Since Mark uses a wheelchair, I was more interested in seeing his surroundings. Mark modeled his bathroom after the one he used at his rehabilitation center. This bathroom had a wide entry and ample room for both of us to maneuver once inside. The tile floor was easy to roll on, and seemed that it would not be too slippery when wet. To keep the bathroom toasty warm, Mark can close the door to keep the heat in. In my new bathroom, I am planning to install Warmly Yours (www.warmlyyours.com) radiant floor heating under the tile floors to give us a little more comfort. Mark’s no-threshold shower is surrounded by tile walls. The shower is large enough to accommodate a personal care assistant should Mark require one. Mark transfers from his wheelchair to a separate shower chair and there are two grab bars on the shower walls to assist in his transfers. The hand-held shower head is mounted on a vertical sliding bar with water temperature and flow control lever handle within reach. There is a long hose attached to the shower head that is handy when it’s time to clean the shower. In my new shower, I am planning to have a built-in bench that will not be too slippery when I transfer to it from my wheelchair. It would also be nice to have shelves in the shower for shampoo, conditioner, and soap. We are also planning to put the water controls close to the shower entry so we can have the water running and the shower area warm before we enter. An anti-scald fitting on the hot water plumbing is a great safety feature to include. In Mark’s bathroom, I noticed he could roll easily under the sink. And the hot water plumbing under the sink was insulated so that he would not get burned. There was a light fixture and tiltable mirror over the sink that serves him well when he shaves. All his toiletries were within reach, stored in wire baskets. There is no vanity around the sink, which for me would be a disadvantage. Women seem to need a lot more products to get ready for the world, so I would like to include lots of drawers and cabinets for makeup, curling iron, hair dryer, and medications. It is also important to install electrical outlets that are within reach. Some can be installed within a cabinet frame to conceal them. It makes sense to utilize grab bars as towel bars. Towel bars, however, should not be used as grab bars. Grab bars can be positioned in strategic locations by the shower and toileting areas. There are many different grab bars on the market, some more decorative than others. I have chosen Great Grabz (www.greatgrabz.com) for my new home. Make sure the walls are reinforced properly for support. I commented to Mark on the lack of a grab bar on the wall adjacent to his toilet. For now he uses the window sill for support. Another detail that makes life easier is a toilet seat height that is comfortable. I am planning to install 17” to 19” high toilet seats in our new home. This makes life easier when transferring from the wheelchair. I have selected the Kohler Comfort Height toilets (www.Kohler.com). Every person will have a personal preference for toilet seat heights based on their body size. When I stay at hotels, I find some toilets are too tall, and my feet don’t even touch the floor. No one should have to jump off a toilet seat! While you are seated at the toilet, it is important that you can reach the toilet paper. There are many different types of dispensers that mount on a wall or set on the floor. Having a dispenser sure makes life easier, rather than chasing a roll of toilet paper across the floor after it has fallen out of your hand. Life’s little conveniences in the bathroom—some you get used to and some you can’t seem to live without. 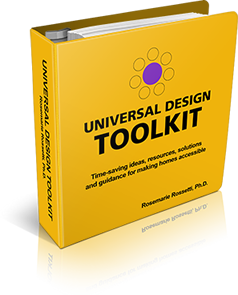 Universal design offers many features that make life easier for those of us with disabilities as well as being just plain good design.